Garrison TR is a custom built security fencing system designed to provide a very high level of strength and security while avoiding the industrial look associated with some fencing products. Developed from Garrison Fencing, our Garrison TR fence installations provide excellent security, they look good and will enhance the value and appearance of your property. Garrison TR is fully custom built and can be manufactured to comply with any specification requirement. If you are looking for a fence with excellent strength and security combined with good appearance then Garrison TR may be the answer. The heart of this security fencing system is the way in which the 25mm x 25mm pickets pass through 50mm x 50mm x 5mm angle rails or double punched RHS rail. 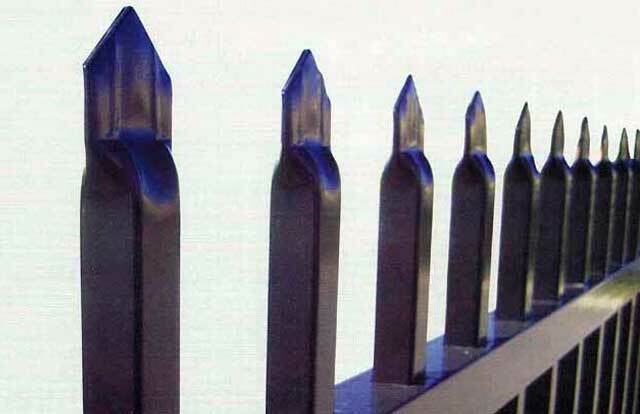 The pickets are welded to the rails at each intersection and cannot be prised off. Prior to fence assembly, the angle rails are Hot Dip Galvanized after piercing to maximise protection against corrosion. All other materials are galvanised and the fence is powder coated and finished in your colour choice for appearance and to enhance the fence's life. Fence height is your choice and appropriate gate designs and gate post specifications are available to suit any fence height. Sliding Gates and other special purpose gates with full accessories can be specified. Intermediate posts will normally be 65mm x 65mm with 75mm x 75mm corners and ends however any size can be specified to meet particular requirements. The “CAITOR TOP” security strip is an option for all gates and provides an effective and unobtrusive security barrier that enhances the appearance of the gate.